One of Sherlock Holmes’s defects — if, indeed, one may call it a defect — was that he was exceedingly loath to communicate his full plans to any other person until the instant of their fulfillment. Partly it came no doubt from his own masterful nature, which loved to dominate and surprise those who were around him. Partly also from his professional caution, which urged him never to take any chances. The result, however, was very trying for those who were acting as his agents and assistants. I had often suffered under it, but never more so than during that long drive in the darkness. The great ordeal was in front of us; at last we were about to make our final effort, and yet Holmes had said nothing, and I could only surmise what his course of action would be. My nerves thrilled with anticipation when at last the cold wind upon our faces and the dark, void spaces on either side of the narrow road told me that we were back upon the moor once again. Every stride of the horses and every turn of the wheels was taking us nearer to our supreme adventure. “That is Merripit House and the end of our journey. I must request you to walk on tiptoe and not to talk above a whisper.” We moved cautiously along the track as if we were bound for the house, but Holmes halted us when we were about two hundred yards from it. I tiptoed down the path and stooped behind the low wall which surrounded the stunted orchard. Creeping in its shadow I reached a point whence I could look straight through the uncurtained window. There were only two men in the room, Sir Henry and Stapleton. They sat with their profiles towards me on either side of the round table. Both of them were smoking cigars, and coffee and wine were in front of them. Stapleton was talking with animation, but the baronet looked pale and distrait. Perhaps the thought of that lonely walk across the ill-omened moor was weighing heavily upon his mind. With long bounds the huge black creatwe was leaping down the track, following hard upon the footsteps of our friend. So paralyzed were we by the apparition that we allowed him to pass before we had recovered our nerve. Then Holmes and I both fired together, and the creature gave a hideous howl, which showed that one at least had hit him. He did not pause, however, but bounded onward. Far away on the path we saw Sir Henry looking back, his face white in the moonlight, his hands raised in horror, glaring helplessly at the frightful thing which was hunting him down. Sir Henry lay insensible where he had fallen. We tore away his collar, and Holmes breathed a prayer of gratitude when we saw. that there was no sign of a wound and that the rescue had been in time. Already our friend’s eyelids shivered and he made a feeble effort to move. Lestrade thrust his brandy-flask between the baronet’s teeth, and two frightened eyes were looking up at us. “It’s dead, whatever it is,” said Holmes. “We’ve laid the family ghost once and forever.” In mere size and strength it was a terrible creature which was lying stretched before us. It was not a pure bloodhound and it was not a pure mastiff; but it appeared to be a combination of the two — gaunt, savage, and as large as a small lioness. Even now in the stillness of death, the huge jaws seemed to be dripping with a bluish flame and the small, deep-set, cruel eyes were ringed with fire. I placed my hand upon the glowing muzzle, and as I held them up my own fingers smouldered and gleamed in the darkness. “He followed the hound to call him off — of that you may be certain. No, no, he’s gone by this time! But we’ll search the house and make sure.” The front door was open, so we rushed in and hurried from room to room to the amazement of a doddering old manservant, who met us in the passage. There was no light save in the dining-room, but Holmes caught up the lamp and left no corner of the house unexplored. No sign could we see of the man whom we were chasing. On the upper floor, however, one of the bedroom doors was locked. A faint moaning and rustling came from within. Holmes struck the door just over the lock with the flat of his foot and it flew open. Pistol in hand, we all three rushed into the room. But there was no sign within it of that desperate and defiant villain whom we expected to see. Instead we were faced by an object so strange and so unexpected that we stood for a moment staring at it in amazement. The room had been fashioned into a small museum, and the walls were lined by a number of glass-topped cases full of that collection of butterflies and moths the formation of which had been the relaxation of this complex and dangerous man. In the centre of this room there was an upright beam, which had been placed at some period as a support for the old worm-eaten baulk of timber which spanned the roof. To this post a figure was tied, so swathed and muffled in the sheets which had been used to secure it that one could not for the moment tell whether it was that of a man or a woman. One towel passed round the throat and was secured at the back of the pillar. Another covered the lower part of the face, and over it two dark eyes — eyes full of grief and shame and a dreadful questioning — stared back at us. In a minute we had torn off the gag, unswathed the bonds, and Mrs. Stapleton sank upon the floor in front of us. As her beautiful head fell upon her chest I saw the clear red weal of a whiplash across her neck. “It is dead.” She gave a long sigh of satisfaction. “Thank God! Thank God! Oh, this villain! See how he has treated me!” She shot her arms out from her sleeves, and we saw with horror that they were all mottled with bruises. “But this is nothing — nothing! It is my mind and soul that he has tortured and defiled. I could endure it all, ill-usage, solitude, a life of deception, everything, as long as I could still cling to the hope that I had his love, but now I know that in this also I have been his dupe and his tool.” She broke into passionate sobbing as she spoke. “A dog!” said Holmes. “By Jove, a curly-haired spaniel. Poor Mortimer will never see his pet again. Well, I do not know that this place contains any secret which we have not already fathomed. He could hide his hound, but he could not hush its voice, and hence came those cries which even in daylight were not pleasant to hear. On an emergency he could keep the hound in the out-house at Merripit, but it was always a risk, and it was only on the supreme day, which he regarded as the end of all his efforts, that he dared do it. This paste in the tin is no doubt the luminous mixture with which the creature was daubed. It was suggested, of course, by the story of the family hell-hound, and by the desire to frighten old Sir Charles to death. 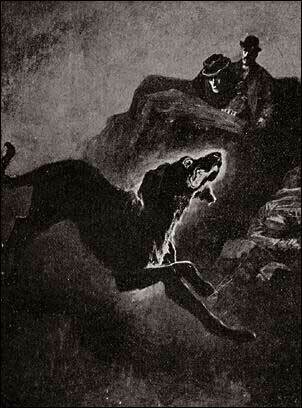 No wonder the poor devil of a convict ran and screamed, even as our friend did, and as we ourselves might have done, when he saw such a creature bounding through the darkness of the moor upon his track. It was a cunning device, for, apart from the chance of driving your victim to his death, what peasant would venture to inquire too closely into such a creature should he get sight of it, as many have done, upon the moor? I said it in London, Watson, and I say it again now, that never yet have we helped to hunt down a more dangerous man than he who is lying yonder” — he swept his long arm towards the huge mottled expanse of green-splotched bog which stretched away until it merged into the russet slopes of the moor.